NOW Mega Hoodia delivers the herbal power of 100% pure Hoodia gordonii, with nothing removed except water. Hoodia was originally consumed as food by indigenous tribes to help endure long, exhausting hunting expeditions. This legally harvested South African Hoodia benefits the environment and the San tribes, and is CITES certified. One common stumbling block to weight loss is breaking bad habits related to food, such as excessive snacking, eating late at night, over consumption, the wrong food choices, or all of the above. Many people have trouble simply getting into the habit of, “shutting off” their appetite. Using an appetite suppressant such as hoodia as part of a comprehensive weight loss plan, that includes a balanced diet and exercise, may help you to eat less, and force your body to use the fat and energy it has stored to promote weight loss. Suggested Usage: As a dietary supplement, take 1 to 2 Vcaps® daily before meals. Consider taking this product in combination with NOW® CLA Extreme™, Diet Support and L-Carnitine. 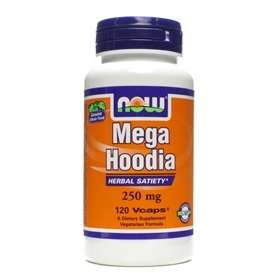 NOW Mega Hoodia delivers the natural nutrient profile found in Genuine Whole Foods. Other Ingredients: Cellulose, Cellulose (capsule), Magnesium Stearate (vegetable source) and Silica. Contains no: sugar, salt, yeast, wheat, gluten, soy, milk, egg, shellfish or preservatives. Vegetarian/Vegan Formula.